I have heard about this iconic high school for a while now. Famous for its castle-like building right in the city of Downtown Tocoma, Stadium High School is famed for the movie production "10 Thing I Hate About You." I have seen other photographers shoot here numerous times, since then I have told myself I have got to go do styled shoot in front of that building too. Little do I know, I would actually have the opportunity to shoot at this spot a lot sooner than I'd imagine. 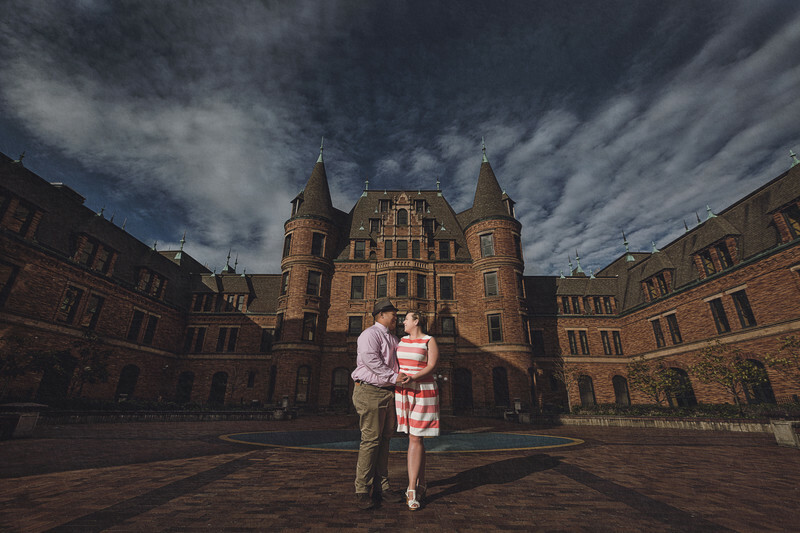 I took Sarah & Raymond to a park in downtown Tacoma for an engagement session. They live in Tacoma, but are having their wedding at Golden Gardens Bathhouse in Seattle. So I thought it'd be nice to do a portrait session right where they live. We originally planned on shooting at the glass museum after our session at Wright Park. However, it was Sunday afternoon, so the museum was already closed. Sarah suggested to go to Stadium High, and I immediately replied, "Yes, I've heard about that place and really can't wait to get there already." The structure of the building and its symmetry are magnificent. With Sarah & Raymond's cute outfit, it enhanced the portrait to anther level. I couldn't be more proud of this image. And there is no doubt in my mind that I will return to this glorious high school someday soon. Location: 111 N E St, Tacoma, WA 98403.